Toshiba's new Japanese laptops are small and feature-packed. Just a day after revealing the first rewritable HD DVD drive for laptop PCs , Toshiba Japan today unveiled a range of lightweight, rugged laptops that weigh as little as 768g, with a battery life as long as 12.5 hours and plenty more besides. 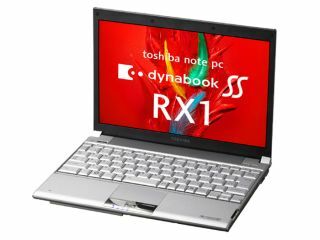 The standout in the new Dynabook SS RX1 series , which comes in a range of versions with incomprehensible nine-letter model numbers, is a 768g subnote that packs a 64GB solid-state drive (SSD) instead of a regular hard disk. In spite of the low weight, it still manages over six hours on a standard battery. The seven varieties of the 12.1-inch laptop can be configured more or less as desired, so we'll single out a few of the other highlights from the goodies on offer. Aside from the high portability factor of the SS RX1 line-up, other geek-lust-inducing technologies include a 19.5mm thick magnesium-alloy body, a transflective LCD that has a switchable backlight, water- and coffee-resistant engineering for those clumsy moments at work and drop-proofing to 75cm. All models are powered by a U7600 Intel Core 2 Duo CPU running at 1.06GHz and will be available in Japan from 22 June, with overseas launches under the Portege R500 badge coming soon after. Pricing remains undecided, but don't expect much change out of £2,000 for the tiddler with the SSD.